This week’s winner comes to us from @VegasDazecom for a classic Fremont St picture. With all the talk and complaining we and several people like us have done about all the changes going on in Vegas, this photo reminded me how much things inevitably change in Vegas, all the time, and if they didn’t, odds are, we wouldn’t have what we have today. This photo (better known as a postcard in this case) was taken from just west of Fremont and 1st street in the late 60s early 70s. It shows the California club still in operation across the street from the Mint. The California Club was sold to Steve Wynn in 1973, shortly after he purchased the Golden Nugget. He promptly expanded the Golden Nugget into the space. The Mint was sold to Binion’s Horseshoe in 1988 who promptly expanded into the space. 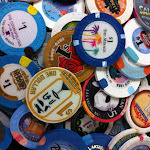 Harrah’s bought the Horseshoe out of bankruptcy in 2004 but only wanted the rights to the name Horseshoe and the World Series of Poker so shortly after, they promptly sold the physical property to the folks who own the 4 queens. The old Fremont & Golden Nugget signage is still up in the picture and of course these signs are perfectly shown off with a black night sky their backdrop, unfettered by they Fremont Street Experience. In fact, the only thing that looks the same today as it did in this picture is the 4 Queens signage. 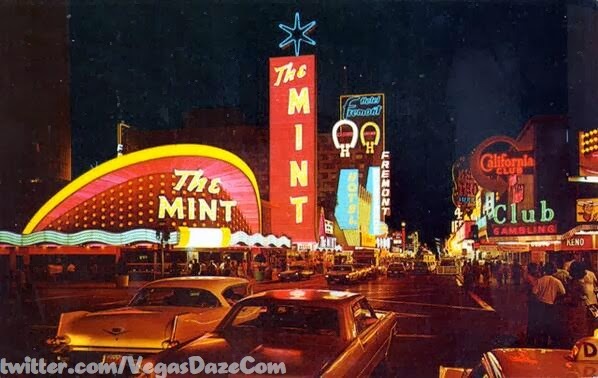 While I would have loved to see Fremont like this, especially the Mint, what we have now is cool as well. Traffic is closed off to the area, we get to watch the properties neon go dark and relight multiple times a night thanks to the Fremont Street Experience and, of course, Fremont still exists. Like an amusement park that hasn’t added a new attraction in years, if things weren’t allowed to change, we wouldn’t have what we have today. I try to remember than whenever I complain about change. Then I remember I know better than any of those fucks so it’s my job to tell them.